Opening Night at Dodd Stadium Sunday, June 16th! 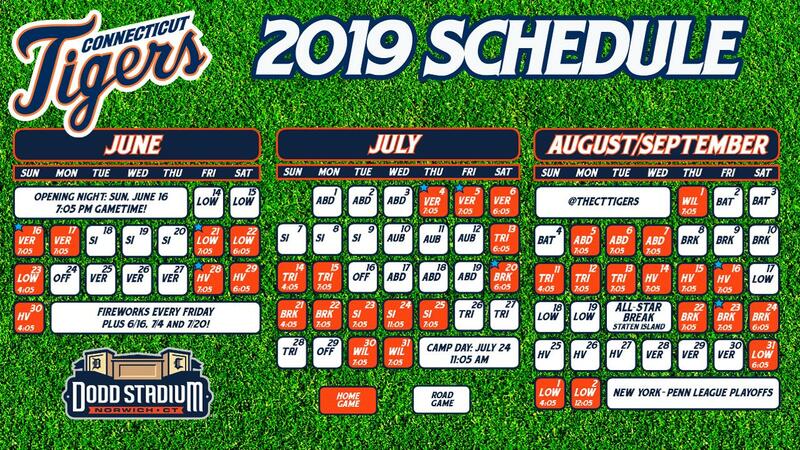 NORWICH, CT- The New York-Penn League and the Connecticut Tigers have released the schedule for the upcoming 2019 season. The season will mark the 10th season for the Connecticut Tigers and the 25th season of Minor League Baseball at Dodd Stadium. The Tigers open up the 2019 season on the road in Lowell to play the Lowell Spinners (Red Sox affiliate) on Friday, June 14th. The Tigers then head home for Opening Night at Dodd Staduim on Sunday, June 16th with a special 7:05 pm start against the Vermont Lake Monsters (A's affiliate) with fireworks after the game! Game time for Monday through Friday home games will be 7:05 pm. The two exceptions will be Wednesday, July 24th at 11:05 am for Camp Day and Monday, September 2nd at 12:05 on Labor Day. All Saturday home games in 2018 will begin at 6:05 pm and all Sunday home games will begin at 4:05 pm with the one exception being Sunday, June 16th at 7:05 pm for Opening Night. Season Memberships to "The Club" for the 2019 season are on sale now! Whether you're looking for the ultimate fan experience or looking to take advantage of great savings over individual game pricing, memberships come with exclusive benefits including a customized jersey, an exclusive bus trip to a road game, free parking and much more! The complete list of benefits can be found online at cttigers.com/theclub. 2019 mini plans will go on sale in November. The Tigers will play five Friday night home games during the summer of 2019, as well as seven Saturdays and seven Sundays. Connecticut will play six home games against the Boston Red Sox affiliate the Lowell Spinners (June 21-23, August 31- September 2), three versus the New York Yankees affiliate the Staten Island Yankees (July 23-25), and six against the New York Mets affiliate the Brooklyn Cyclones (July 20-22, August 22-24). 2019 will feature eight fireworks shows including five Friday Night Fireworks as well as shows on Sunday, June 16th, Thursday, July 4th, and Saturday, July 20th. A full list of 2019 promotions will be released in the months leading up to the start of the season. The Connecticut Tigers are the New York-Penn League affiliate of the Detroit Tigers located at Dodd Stadium in Norwich, Connecticut. 2019 season memberships to The Club, and team merchandise are now on sale! The front office and box office is open daily from 9 am to 5 pm Monday through Friday and can be accessed in person or by calling 860-887-7962.